I am proud to present Stephanie Connor from http://www.kiddoscook.com/ who is a working mother of a 4-year-old boy with food sensitivities. 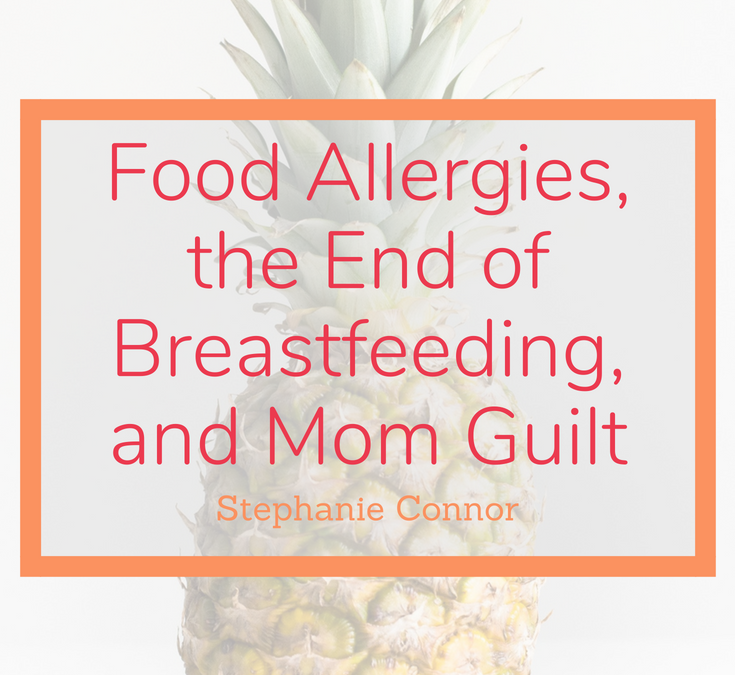 Today she is sharing ” Food Allergies, the End of Breastfeeding, and Mom Guilt ” Pulling from her own experience, Stephanie shares from her heart and from her past experiences. I have found her post very helpful and inspiring. Let us get to know her and learn from her experience on how she dealt with food sensitivities. To say we enjoyed an “extended” period of breastfeeding would be an understatement — at least by American standards anyway. I never thought I’d nurse so long. Breastfeeding was important to me, but I thought, “OK, six months, and we’re done.” By the start of 2015, I decided, my body would be mine — all mine! — again. After pregnancy, a C-section and six months of breastfeeding, I would have earned that. But six months came and went, and nursing wasn’t hard. We didn’t have a lot of struggles. When he started getting teeth, he bit me once, and I pumped bottles for him for the rest of the day. Lesson learned: He never bit me again. Then, I figured I’d stop around his first birthday, but that’s when we learned of his allergies. There was nothing to wean him to — no dairy, no nut milk, no soy milk … So, we kept nursing, eventually getting to just nighttime and morning sessions and naptimes on the weekends (and I kept pumping during the week, so he’d have milk at school with lunch). I nursed when sick. I used essential oils to treat head colds because you’re not supposed to take certain drugs when breastfeeding. I never ate anything he couldn’t eat. (That meant no eggs, dairy, soy, nuts or peanuts for a year, and continued with no eggs or dairy after that.) I nursed the day after an appendectomy. “He nursed, we hugged, he turned and laid on his side and drifted sweetly off to sleep. It was a special thing we had. I tried to let him lead the weaning, but he clearly wasn’t going to. So after two years and nine months, I decided it was time. I started letting him know a few weeks in advance that the “baby milk” would soon be gone. On our last night, I let him know it was the last time for baby milk, though I’m not entirely sure he understood. He nursed, we hugged, he turned and laid on his side and drifted sweetly off to sleep. I cried quietly. The end of an era. And the perfect end. A beautiful, sweet end. And honestly, it was just a few rough days/nights that followed before he arrived at full acceptance that the baby milk had indeed run out. I almost caved a few times, but this was for the best, I told myself. I leaned on my husband to do bedtime a few nights. Meanwhile, I shed a few tears in my room, knowing this was hard for my son, and wondering if I really should’ve done it. But honestly, he handled it far better than we expected, so maybe it really was time, I assured myself. One of the upsides is lifted restrictions on what I can eat. Hello, dairy and eggs. Welcome back! But it’s not like I’d imagined it would be. I didn’t run out and order a giant cheese plate. I still haven’t had macaroni and cheese (and it’s been nearly four months). When we have pizza as a family, I continue to order mine cheese-free just like his. In the first four weeks, I had just four eggs. Menus overwhelm me with all of their choices. Plus, I felt good sans dairy, so why go back to eating it? And really, maybe I should still be egg- and dairy-free for my son? A show of solidarity? For the most part, I’ve been dabbling in dairy (and generally, when he’s not around). There was one day, though, where I went all out. My husband and I took a day trip. I had a mushroom and tomato bisque (a bisque!) and cheese (cheese!) on a burger at lunch, a cream (cream!) sauce on ravioli at dinner. Oh, and a decadent chocolate mousse parfait with ice cream and whipped cream (cream, cream, cream!). I felt a twinge of guilt that day. And not because it was the least healthy I’d eaten in years. I quickly forgave myself for that. But I knew my son was off having his usual chicken and rice. He doesn’t know what he’s missing, but I do. I learned a lot in my effort to feed both of us in accordance with his allergies. I learned new things about cooking, and I learned about what makes me feel good. I discovered I don’t need dairy. And boy, oh boy, did I discover that this mom guilt thing comes at you from all angles. So, yes, now that I can eat things my son can’t, I do. But I do so in moderation, and I try to be aware of and sensitive to his diet (not to mention, aware of what my body seems to thrive on). It seems like the least I can do. I’ve learned so much as a result of my son’s allergies and our extended nursing. Motherhood obviously changes you, but sometimes in ways, you can’t grasp until you feel them. I have discovered new levels of selflessness that I didn’t know I was capable of — and new levels of love. Every day, my son makes me a better mom and a better person … just by being who he is. And for that, buddy, I thank you. When my son could start eating food, I was so excited. I did homemade baby purées. He hated them. I introduced veggies first like a good mom should. He was unimpressed. Then, came food allergies to further complicate mealtimes. Followed by lots of one-handed cooking with a toddler in the other arm. I know I’m not alone. Being a working mom who wants to find time for grocery shopping and farmers markets and recipe hunting and cooking every night is HARD. If you’re in the same boat, maybe you’ll find something here that helps you — like a dinner your picky kid might actually eat. Or a tip or a trick that helps. That’s my goal, anyway. And hey, if all you get is the knowledge that you’re not alone in your own food fight, that’s fine too.